WASHINGTON— The Center for Biological Diversity released a report today detailing the forms of legal authority that President Obama, as well as future U.S. presidents, possesses to stop new federal fossil fuel leasing on public lands and oceans. That step would prevent up to 450 billion tons of greenhouse gas pollution from escaping into the atmosphere and worsening the global climate crisis. It would also protect America’s public lands, water and wildlife from destructive development of oil, gas, coal, oil shale and tar sands. 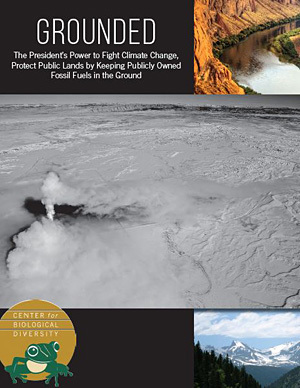 The report is called Grounded: The President’s Power to Fight Climate Change, Protect Public Lands by Keeping Publicly Owned Fossil Fuels in the Ground. It describes broad authority under the Mineral Leasing Act, Outer Continental Shelf Act and Federal Land Policy and Management Act that the president can use — without waiting for Congress — to defer and ultimately prohibit new leasing of publicly owned, federal fossil fuels onshore and offshore. Releasing those 450 Gt CO2e (the equivalent annual pollution of more than 118,000 coal-fired power plants) is incompatible with any U.S. share of global carbon limits that would keep emissions below scientifically advised levels. More than 67 million acres of public land and ocean — an area 55 times larger than Grand Canyon National Park — are already leased to the fossil fuel industry. Both reports come as world leaders prepare for December’s climate negotiations in Paris, where they must negotiate a binding international agreement to limit greenhouse gas emissions. Since the United States is the world’s largest cumulative emitter and one of its strongest economies, its leadership in those negotiations is vital. Scientists tell say that to preserve a habitable climate — in which the world isn’t ravaged by rising seas, food shortages and horrific weather events — we must keep a vast majority of fossil fuels in the ground. Download The Potential Greenhouse Gas Emissions fact sheet here. Read our "Keep It in the Ground" webpage here.